Have you ever been disappointed on how a online casino treated you when it came to so called random cards or service? Don’t let that happen again! 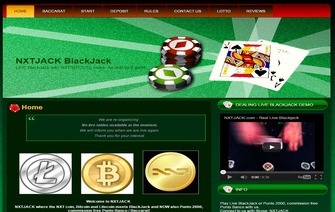 NxtJack is a live dealer bitcoin casino that offers a variety of blackjack tables and polite dealers. Within this review you will grow to understand why we are excited about the perks being a real bitcoin player with NxtJack and what you can expect being a guest of the casino. NxtJack is a Skype live dealer casino and because of such they currently only offer Blackjack (Lotto is in the works) and Baccarat, other table games have been considered and might be added down the road if enough customers request for the games. The casino game wagering limits are a tad limited at the moment but as the casino gets more active they will be increasing the limits for players who like to wager more than a little bitcoin per hand. As you read this you are able to wager up to .01 btc per hand. Player Rules: Minus the common rules required at most if not all online casinos players should be aware of the particular blackjack terms NxtJack has enforced prior to playing. You can play up to two unique hands at anytime while playing and are able to split once per hand. You will need a video camera to make plays but you do have the option of not showing yourself if you so choose. An audio device like a microphone would also be helpful as you will be able to be more hands on and give the dealer a better hands on who the guest is. Although it’s not necessary, it makes it much easier than having to text on Skype if you would prefer to hit,stand, or split. Dealer Rules: The dealer will never have a hole card which is unlike most casinos locally or online. So once your decisions have been made on your hand then the dealer will deal a 2nd card to determine the hand. One important rule some folks get confused on comes from Blackjacks and 21’s. If a player hits to 21 and the dealer pulls a blackjack the dealer automatically wins unless the player also happens to receive a 21 than that particular hand would be a push and bets refunded. The dealer shuffles and deals two decks of cards and a player may request a check the deck card count if for any reason they believe the dealer is possibly somehow cheating. Although this casino does not offer any no deposit or signup bonus they do offer a magnitude of other perks. One of these perks is the any jack wins promotion. If your dealt a Jack on the 2nd card you automatically win that particular blackjack hand. Another daily promotion currently running is the 2 to 1 blackjack payouts. When your dealt a blackjack you automatically (assuming dealer does not) receive 2 to 1 on your initial bet. We have been told these promotions are for a limited time so this would be a great opportunity for you to receive mathematically an upper edge percentage wise. Perks like this will dominate long term over any signup bonus any bitcoin casino will offer you. Using the Skype network has became a great asset to NxtJack as it offers guest and active players a way to communicate with them at anytime. Instead of only being able to email now your clearly able to call, instant message, video chat, or email! No other company at this time can compare to the availability as they have. When you do have a question you can also be assured the answers you receive will be complete and accurate as the dealers are highly trained with many years of experience. One of Bitcoin Casino Pro’s main rating guides is how financially solid a company is. This does not translate into an organization needing hundreds or thousands of bitcoins but it’s really based on what they are offering guest and how could they pay if such a player wins. During the initial interview with NxtJack the owner was transparent and honest on being somewhat limited. They also mentioned this was the number 1 reason why the limits are currently low and in effect until such balance increases. NxtJack went a step further and verified the paper wallet they provide depositors and can be confirmed with the image we have publicly published below. So with the financial restrictions in place a casino player should not panic. They also do have access to a much larger cold storage balance if needed and can be accessed during anytime to increase the paper wallet if needed. With the company being transparent and becoming upfront with there casino plans and security information we are please to offer them an elite initial rating. The limits are in place and with a staff that has passion for Bitcoins and the gambling industry one would only expect such a rating. The company has been put on a close watch and will have limited promotional areas until we are absolutely golden this company will be one of the elites. We like the concept and ideas brought forth and expect them to be around many more years to come. Bonus The more you play the more advantages you get! Although not on a regular basis, there are daily promos for the most active players.